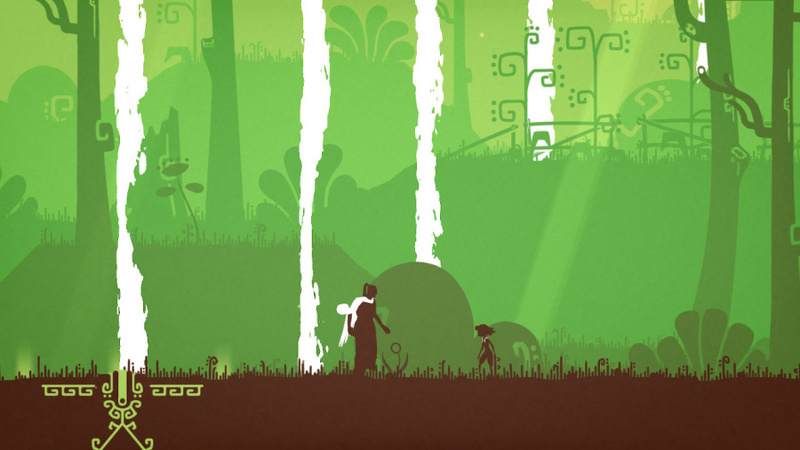 Some video games gently pull you through a narrative experience, offering the player everything they need along the way without any barriers or fuss. Movement is unrestricted, the environment is an ally, and there are no pressures of failure or time in sight. And then there is The King’s Bird. Developer Serenity Forge has thrown their hat into the precision-platformer ring with a game that poses no lack of challenge nor demand of skill. Those who live by the “git gud” mantra may feel right at home here, although there are a few noteworthy wrinkles that keep The King’s Bird from being too derivative of similar indie outings. The adventure begins when a feminine figure awakens and makes her way toward a brief, heated confrontation with a royal father figure; or at least, presumably so, since “dialogue” is delivered via musical sound effects, and no text accompanies the exchange. Further clues to the underlying story can be found in background murals, and perhaps in considering the general no-longer-pristine state of the world. Our titular bird gains a flowy white scarf, along with the power of flight (or gliding, more accurately), and thus embarks on her journey. The tutorial intro offers sections to practice her platforming abilities, along with background art depicting button-presses and her position to match. She can scamper onto ledges, she can wall-jump, she can slide down inclines, she can zip down slanted ceilings. This is a game of momentum – building it, keeping it, mastering it. 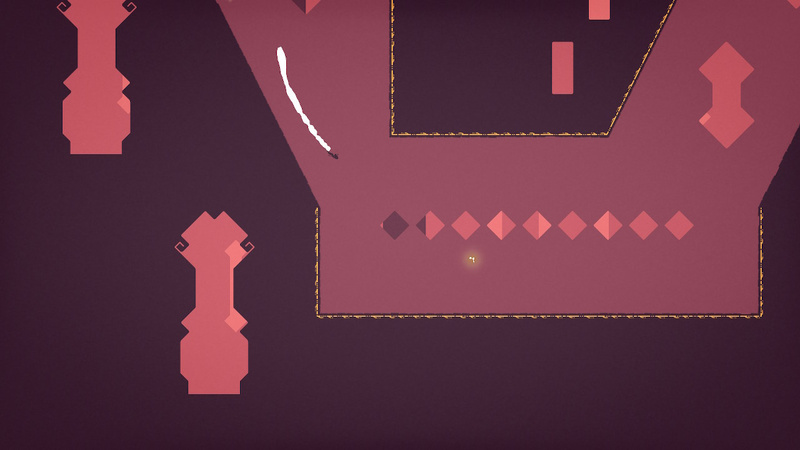 The protagonist can dash with RZ and glide in midair with LZ. It is from these two moves that her repertoire unfolds and the player will form chains of button commands to traverse the dozens of stages to come. The gliding feels great, something akin to the cape from Super Mario World, and forms the highlight of The King’s Bird – building speed and launching into the skies, carefully steering over and under the features of the landscape, offers a real thrill. 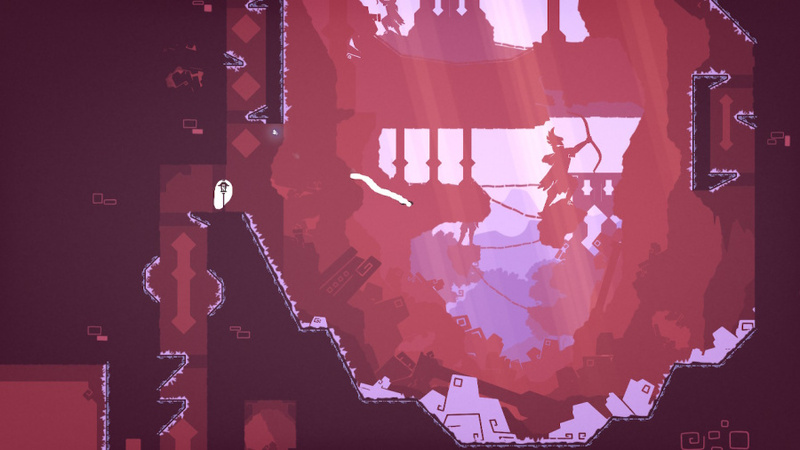 The King’s Bird is trying to set itself apart from other platformers with this gliding mechanic, but what might be more interesting is another, more subtle movement: not only can the protagonist wall-jump, but when she uses a dash on contact with a wall, she will dash upward against the wall somewhat. This is used constantly for traversal throughout the levels, and by gaining altitude is combined with the gliding to unlock new vertical possibilities. The design philosophy is to tie double-jumping to wall contact, rather than have it freely available, and this distinction allows for some very tight, twitchy little spots of intense challenge. The player’s mastery of these movements is put to the test across four worlds, or Kingdoms rather: Forest, Lake, Sky, and Fallen. Each of these worlds has a hub area, where doorways can be unlocked to access smaller groupings of four levels each. Beating a foursome unlocks a new doorway, until the player has earned access to a Shrine, which adds a wrinkle to the story and transitions to the next area. In each individual level, the aim is simple: reach the goal at the end. 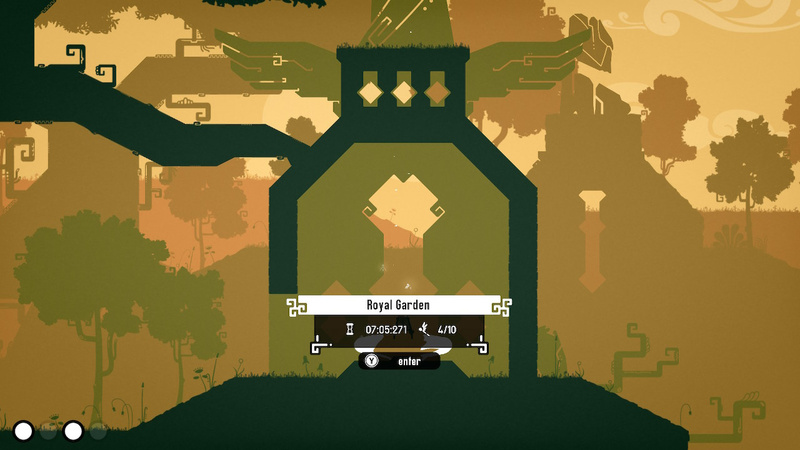 Although the Kingdoms vary slightly in theme, this game takes a minimalist approach to graphical detail and narrative weight. The limited-palette, high-contrast visuals are just the table setting for a steady diet of every possible permutation of Dash and Glide and Jump trajectories. The design is very tight, with very little room for error – some areas especially so – and even more especially so toward the endgame. The player’s only foe is their self, in a sense, because there are no enemy characters. Death comes at the hand of bottomless pits, or water, or ever-presents thorns that dot and blot and cover this world. Fortunately, checkpoints are plentiful, and respawns are near-instant to the last one attained. An outside observer may think some of these lamppost checkpoints are comically close together; although, upon actually playing the thing, you will be grateful for each and every one. One other gameplay aspect is optionable collectables called Spirit Birds that populate each stage. Touching them enables them to follow you for the rest of the level, which becomes a pretty sight when you have several. The problem is that they are small, compared to an already-small protagonist, and easy to lose sight of against some of the lighter backgrounds. Ultimately, this does not mean much, since they do not affect progress, but collecting them all in order to unlock a little more story flavour is likely too much of a pain for most to bother dealing with. The King’s Bird sports an enjoyable soundtrack, gracious in how its melancholy melodies never overpower what’s happening on-screen, but accompany them with a consistent, pleasant sensation from rich arrangements. 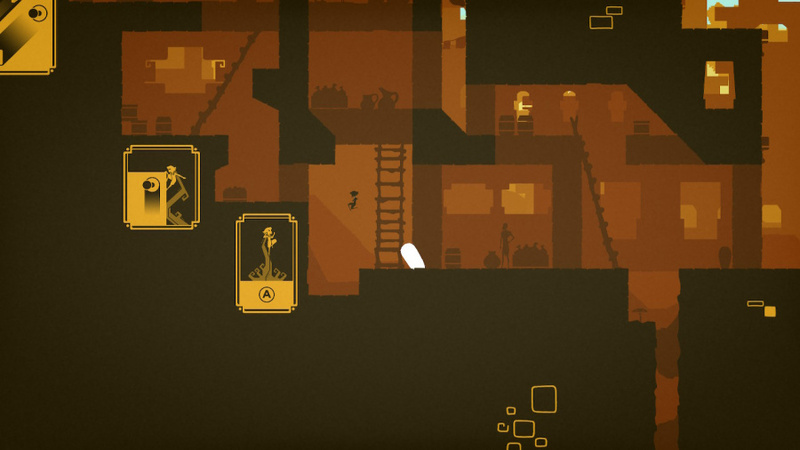 Between that and the unobtrusive plot, along with the somewhat minimalist graphics, at least Bird makes its intentions clear. This is a precision platformer through and through, head to tail, and the player will need to accept this wholeheartedly if they wish to succeed. Later sections will ask the player to not only defy gravity, but slap its mother and call it nasty names. Some portions have near-zero room for failure, and may take many, many attempts to conquer. We imagine many players will swear under their breath at this game, but learning to laugh at the sudden inexplicable deaths might be key to improving. The vast majority of the spaces in this game only have one way out, and it is up to the player to figure out the methodology through good ol’ trial and error. This can be an irritating headache, for sure. 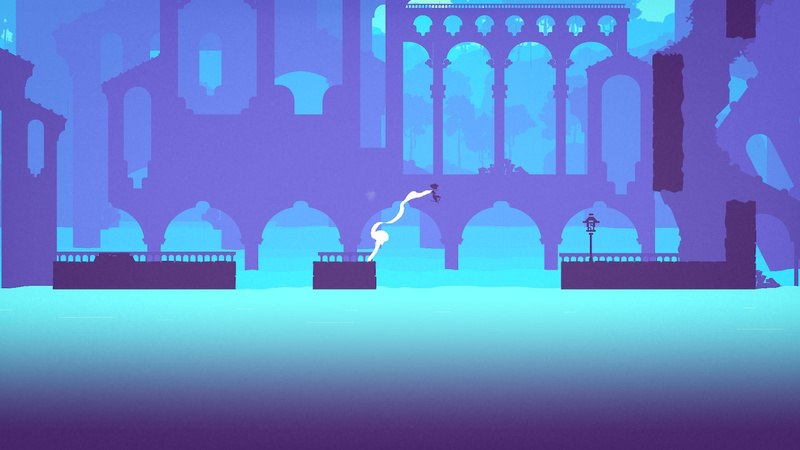 The King’s Bird is a game built for speedrunners and high-skill players. If there was any doubt, it should be noted that the majority of the in-game text takes the form of showing the player their best time per any stage. The message here, even in completing it, is to try again and improve. However, there is one saving grace that must be mentioned, one addition to The King’s Bird that truly adds a valuable dimension: Assist Mode. For those who want an easier playthrough, or are stuck at a particularly difficult passage and need a little help, Assist Mode can be activated and change some game parameters. You can opt for longer glides, or to no longer be harmed by the spiky surfaces, or even skip to the next checkpoint altogether. There are several different options to toggle on or off in any combination the player would like, in order to craft an experience more tailored to their taste for challenge. The Assist Mode is the refreshing cherry on top of what would otherwise feel more like a torturous slog throughout, though even with all its assistance the player will still probably have problems with the final area of the game when the entire formula suddenly changes. Although The King’s Bird definitely reaches heights of difficulty at times, at least it does to transparently, and presents prospective gliders with a simple question: can you train yourself to beat this challenge? Ultimately the answer is ‘yes’, but whether or not you’ll want to devote the time is up to how much you enjoy the genre.